Twice daily and once on Sundays, the small museum at Simanindo puts on a traditional dance performance for tourists in front of three towering traditional Batak houses. 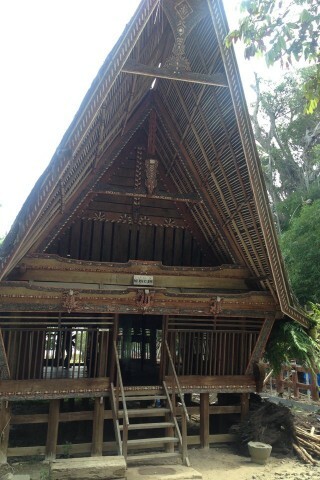 Browse places to stay in Lake Toba on Booking.com. Book Now - Pay Only When You Stay. The performance traverses through 11 different phases associated with the slaughtering of a buffalo, among other things. Although no buffaloes are slaughtered in these performances, a live buffalo is used as local Batak dancers dressed in traditional costume surround the beast and dance. Atop one of the traditional houses sits a troupe of musicians who belt out hypnotic Batak tunes. The whole performance is meant as an introduction to the old ways of the Batak Toba people of which some traditions exist today. Aside from the dancing, there is a traditional house filled with old dust-covered knick-knacks, of which most is of passing interest only. If you’re planning on touring the island, this place is certainly worth a stop and will take less than an hour of your time. Follow the road which circles the island for an hour north of Tuk-Tuk and the museum is signposted on the right as you enter the village of Simanindo.